• PLOT SUMMARY: "Birth of a Super Villain!" Collects Bomb Queen (2006) #1-4, Bomb Queen: Queen of Hearts (2006 2nd Series) #1-3, and Bomb Queen (2007 3rd Series) #1-4. Story and art by JIMMIE ROBINSON. BY POPULAR DEMAND! 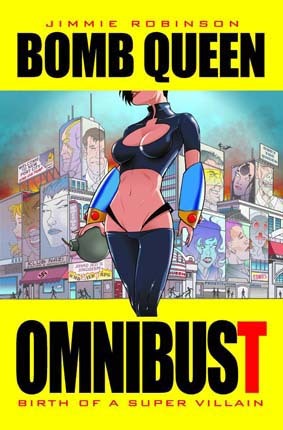 This deluxe OVERSIZED hardcover collects for the first time ever between two covers BOMB QUEEN # 1-4, BOMB QUEEN II # 1-3 and BOMB QUEEN III # 1-4, plus more extras than you can shake a nuke at! Not for the weak of heart, has been known to cause rashes in some cases. Check with your doctor should swelling develop...or not. Hardcover, 328 pages, full color. Mature Readers.